discourse, even about important issues. Politicians scream at each other from ideological fortresses, lobbing insults across the aisles instead of having the tough conversations of governance. Where are the Leaders? What has happened to Respect? 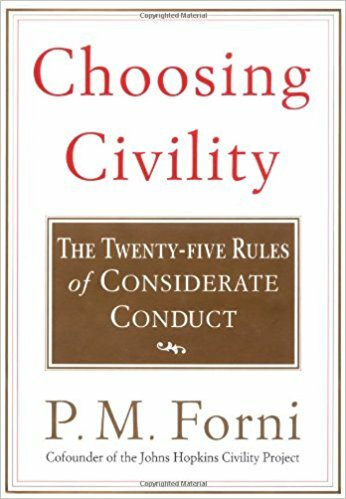 Choosing Civility: The 25 Rules of Considerate Conduct by P.M.Forni. 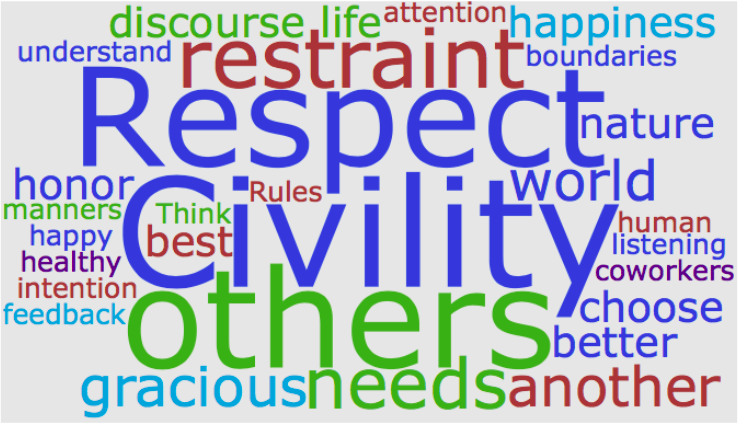 Rules of civility have been around for a very long time. They appear in the text of all religions from Judaism and Christianity to Confucianism, from Islam to Hinduism. They are found in Renaissance writings, Victorian-era manners books, and in the works of philosophers from Plato to Kant. Following these rules may not feel like a shortcut to a good life. Civility requires work and dedication. But so does Happiness. If you want to strengthen any muscle (intellectual, physical, or emotional) you must stretch and work it regularly. 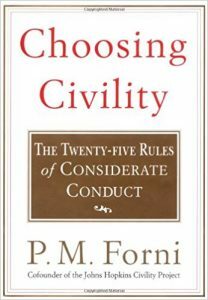 Forni believes that one major consequence of civil behavior is to “lower the amounts of stress in everyday life, especially in the workplace.” Hmm – we can all use a good dose of that, eh?! What follows are the 25 Rules followed by my tiny summary. As you scan, notice what resonates for you. Pay attention. Attention is a tension connecting us to the world around us; only after we notice the world can we begin to care for it. Open your eyes and observe the world around you. Take in the fullness of that amazing person sitting across from you in conversation. When you shift from superficial and transactional to truly “seeing” the world around you, it feels more natural to engage in behavior that will deepen your relationships. Acknowledge Others. Avoid treating anyone—from coworkers to anonymous retail clerks—as invisible. When you make eye contact, offer a simple “good morning,” or use someone’s name at the beginning of an email, you acknowledge their existence and legitimacy. Think the Best. Assume positive intent: most people are doing the best they can with the resources and the wit available to them. What stops us from good listening is that we focus on ourselves and our own needs instead of focusing on other people. Remember that most people don’t need you to solve their problems; they just want to feel heard and safe. Be Inclusive. When you create boundaries, draw them around ideas, not people. Strive to push past your discomfort with the unfamiliar to be curious, instead. Speak Kindly. Learn how to be direct without offending, both in word and tone. You can deliver even critical feedback in a kind, caring way. Don’t Speak Ill. When you gossip or speak unkindly of people when they are not present, you say far more about yourself than you do about those others. Accept and Give Praise. Compliments and appreciation cost you nothing, yet have great value when given to another. In like manner, when someone else gives you that Gift, accept it graciously. Respect Even a Subtle “No.” Honor other people’s boundaries. It’s not always about You. Respect Others’ Opinions. Respecting what others think does not mean we are being untrue to ourselves; it simply honors their right to look at the world differently than we do. This rule is a prerequisite to civil discourse and healthy debate. Mind Your Body. Good grooming helps us to feel better about ourselves and shows respect for others with whom we interact. Be Agreeable. If you are always the stubborn cuss who won’t go along with anyone else’s plans or ideas, you are being uncivil. You need not always say Yes, but look for opportunities where you can at least compromise in service of the group or a relationship. Keep It Down (and Rediscover Silence). Even in today’s always on world, there are places (houses of worship, libraries, theaters, public transportation) where loud talking and digital noise are inappropriate. Respect Other People’s Time. Wait your turn to speak. Manage your calendar so as to be punctual and available for commitments you have made. Begin and end on time. Respect Other People’s Space. Whether with coworkers in their cubicles or with partner/kids in your home, understand the prevailing culture and honor the norms that exist around entering or using other peoples’ space and things. Apologize Earnestly and Thoughtfully. Badly handled, high profile apologies make headlines. When you apologize, make clear that you know what you did was wrong, that you understand the effects of your actions, and that you are not looking for excuses. Assert Yourself. A healthy attention to your own needs is required for you to be happy in the world. Assertiveness is that space where are you honor your own Yeses and No’s without violating the needs or rights of others. Avoid Personal Questions. Civil conversations generally do not inquire into religion, politics, money, personal relationships, health, or physical appearance. Care for Your Guests. Be gracious in your hospitality yet clear about responsibility. If you expect a dinner guest to bring a dish, offer guidance; if a houseguest is expected to do their own laundry, make sure they are familiar with the washing machine! Be a Considerate Guest. Clean up after yourself, show respect for other people’s stuff, and don’t overstay your welcome. Think Twice Before Asking for Favors. Consider the impact on others before you ask. Strive to keep the system in balance—say Yes to as many favors as you request of others. Refrain from Idle Complaints. If you are more interested in finding Blame then in finding a Solution, then you are whining. Don’t do that. Give Constructive Criticism. If your intention is to help with the problem, please share. If your intention is to humiliate, manipulate, or exact revenge, better to hold your tongue. Don’t Shift Responsibility and Blame. If you did it or caused it, own it. Notice that none of these rules require that you be a conformist or in anyway subjugate your own needs. You can live your life fully, authentically, and creatively, AND do it in a way that elevates you and everyone around you. Put another way, your Happiness never needs to be at the expense of someone else’s. If you serve in the role of a Leader, seek balance. You can exercise power AND be civil. You can command AND respect others. Remember, Leadership is not about a title; anyone can be a leader who shows consideration for others and the greater, long-term good. Keep that in mind as you Lead or when you assess the skills of those who lay claim to the mantle of Leadership. The 13 Principles of Happiness offer a framework for a less-stress life. Print a copy here, and post it on your workstation or fridge as a reminder to live your life deeply and from a happy space.